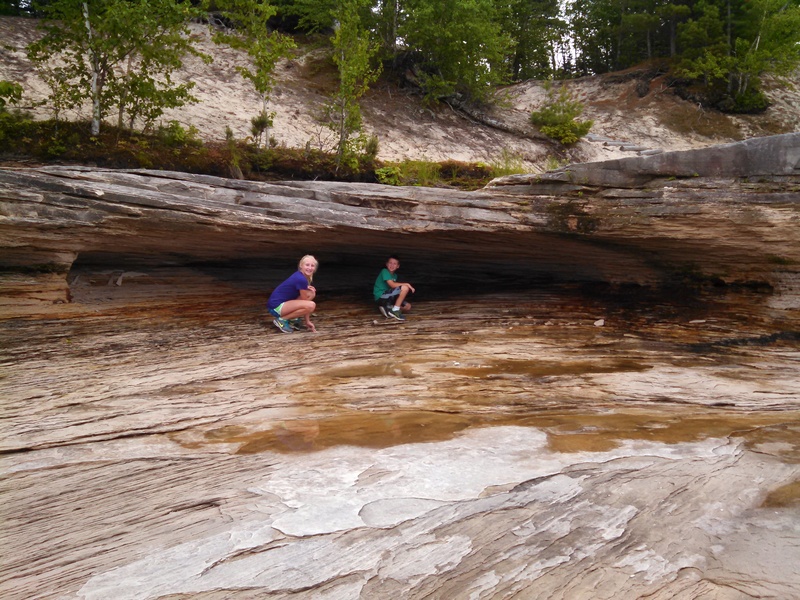 Part of our vacation this year (and last) we visited Michigan’s Upper Peninsula. I love this part of our state. So much untouched land. Trees for miles and miles (which can get a bit boring on long drives). 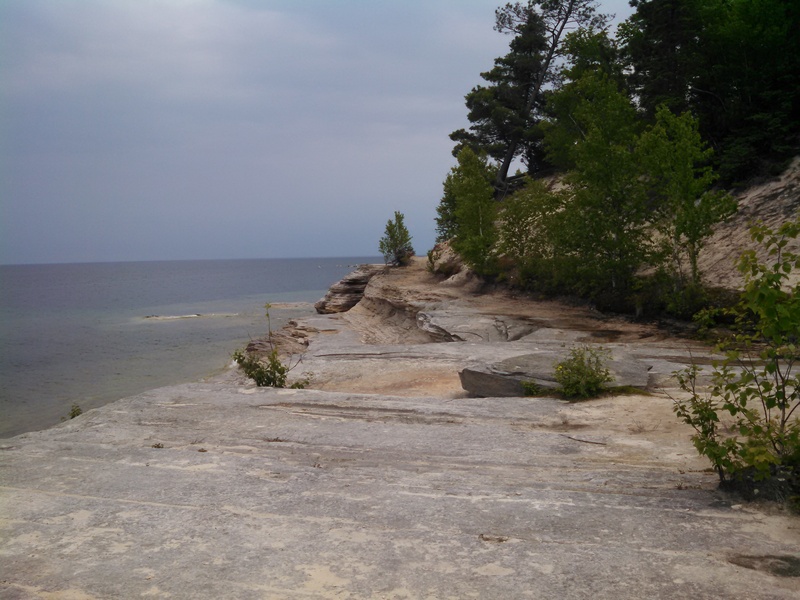 But there are so many treasure hidden in this beautiful part of the Michigan. 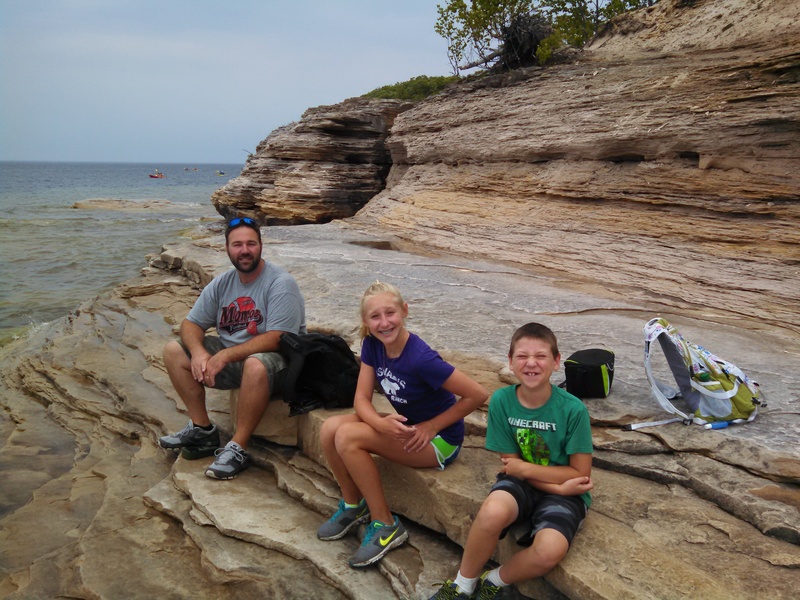 One of these treasure we discovered last year when we visited was Pictured Rocks. Wow. Talk about seeing God’s glory. He totally out did Himself. 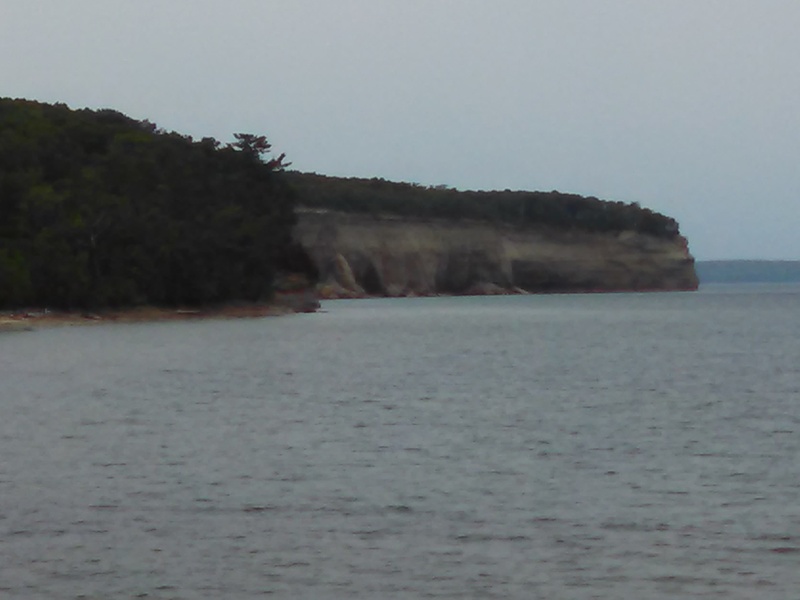 There are a couple of ways you can view pictured rocks. One is to get on a boat and see them from a distance or you can hike to get to them. 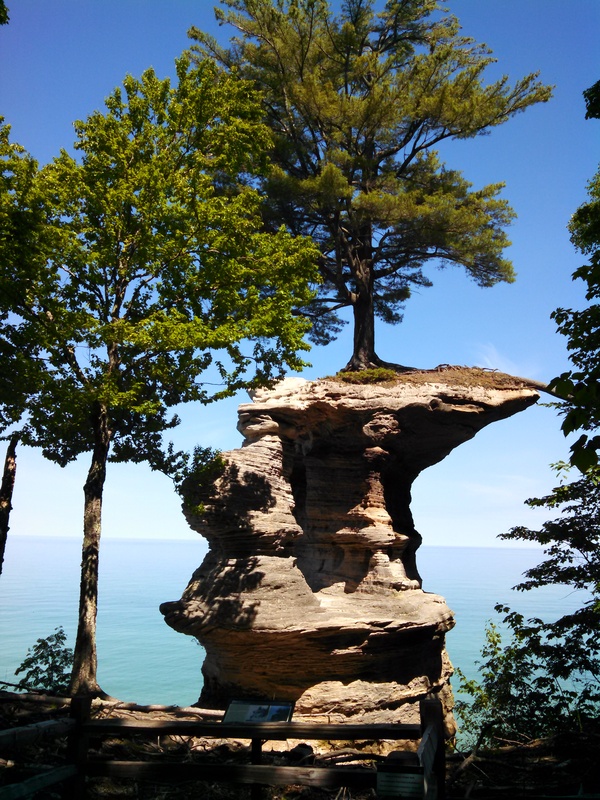 Last year we braved it and hiked to Chapel Rock. 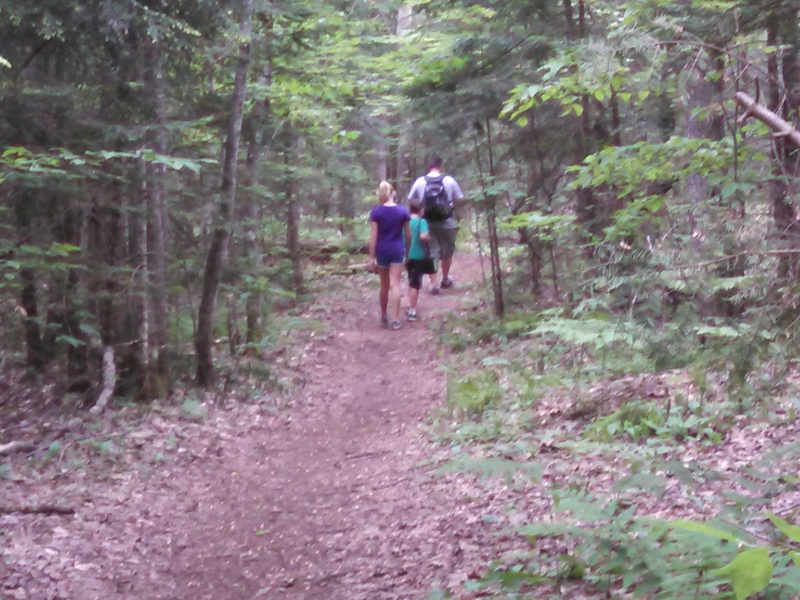 It was a long six-mile hike but worth it and we decided to do another hike this year. We decided to go to Mosquito Beach. know why I think this is hard, I have a lot of energy. But, the further we moved from the beginning of our hike and closer to the middle the muddier it got. Those who live in Michigan know we’ve gotten an ABUNDANCE of rain this year. So much so farmers had trouble getting everything planted in time. Patrick lead. the two kids were next and I followed behind. When we came to muddy areas Patrick would find a way around it. However, my nine-year-old son being a normal gotta-try-it-own-way-boy would often try to find HIS own way. Inevitably, he would end up having to backtrack and go the way his dad had gone. All this extra maneuvering added extra time to the hike and about halfway through we were all wondering if it was worth it. We were getting muddy and tired. Finally, the sound of water met our ears and we knew we were getting closer. Before we knew it there was a beautiful sight. A beach of exquisite rock and Lake Superior. Ah. We walked around and then found a “rock bench” that we felt God provided just for us to sit and eat our lunch. We found rest and nourishment while being surrounded by our Creators handiwork. start out with tons of energy and think nothing can stop us now. But the truth is even if we know Jesus we will encounter mud, detours, things that will discourage us. Jesus never promised no troubles but He did promise to never leave us. Just as my husband lead us around the yucky parts Jesus leads us around or through the yucky parts of life. However, we have a choice and we can go our own way. But like my son we usually find out our Father knows best and end up following Him eventually. For some of us we may wonder from the path longer than others but we do find our way back and our Father is waiting for us ready to lead us on. The end will come, we must watch and listen for signs and maybe without warning you will be standing in the beauty of it all. You will see that all the muck was worth the end result, we did. You will find rest and nourishment in the presence of your Creator who made all for you. He was thinking of you the whole time, guiding, directing, loving. Where you right now? Are you just starting out, full of energy, nothing can stop you? Are you in the middle, walking through mud, trying to go your own way? Hows that working out for you? Or are you following your Father’s lead even though it’s hard, it’s not easy, do you have your eyes on Him? Or are you on the beach, taking it all in? Sitting in His presence, resting in Him? 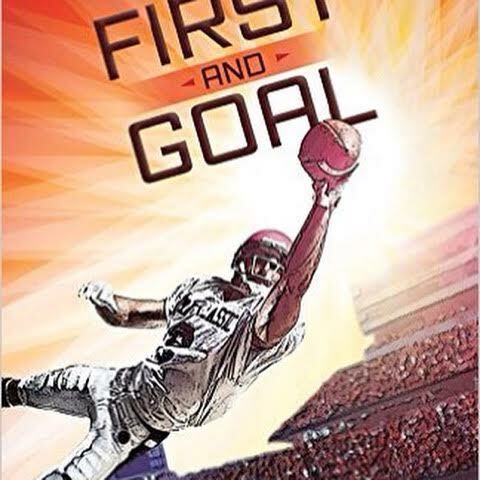 First and Goal, What Football Taught Me About Never Giving Up, published by Harvest House Publishers. Just newly released. Now that I’m no longer playing professional football, I’m working for Champion Management, a marketing firm in Dallas. I also got recently married to beautiful, supportive Christian woman, Emma. She’s amazing. And I’m starting a foundation – Type Won – to help kids with Type One Diabetes lead healthy, active lives. Where did you get your book idea? When I got diagnosed with Type One Diabetes as a teenager, I didn’t have mentors. I really struggled with managing diabetes while competing as an athlete. It took a lot of trial and error to excel in the sport of football. I learned a lot through those difficulties and went on to play football at the University of Wisconsin. Then, while in the NFL, playing for the San Diego Chargers, my mom called me. She’s a Christian author and was planning to attend a writer’s conference. She suggested I write a devotional about my experiences with Type One Diabetes and my journey into the NFL. I had mentored kids with type one diabetes in college and agreed writing a devotional would be a great way to encourage youth to reach their goals in spite of obstacles. We put together a one-sheet and my mom pitched the book and Harvest House offered us a contract. Do you outline or are you a seat-of-the-pants writer? OR HOW DID YOU WRITE FIRST AND GOAL, THEN? 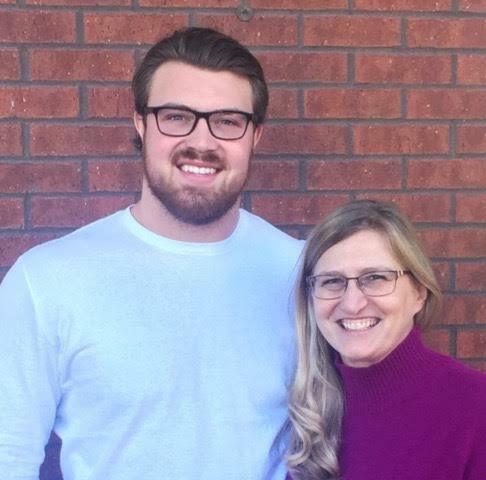 I got together with my mom (the ghostwriter) through Skype or phone or in person and we put anecdotes of my life together in the form of short devotionals and added football terminology. We really enjoyed working on the project together and she even has one last devotional in the book called, Extra Point. Moms always get the last word, or extra point. While working full time and getting my foundation going, I’m pretty busy, but I’d like to write another book – an informational, practical book based on my experieces with diabetes and geared toward helping those with diabetes stay healthy and active and succeed in life, whatever their goals. Well, like in football, getting cut from a team is pretty commonplace. So is getting a few pages or words cut in the final edits in writing. Here’s an excerpt from First and Goal about being “cut” that we had to “cut” due to too many pages for the book. Though my devotional is aimed at the teen market, it’s really a book for all who need a little inspiration. In the end, in a fun and inspiring way, readers might learn some football terms to impress family and friends. On the curl route, the receiver runs hard downfield as if to run deep, and then—between 12 and 20 yards—he turns sharply and takes two steps back to face the football. The comeback route generally is run along the sideline. To work effectively, the quarterback usually throws the ball before the receiver turns. He throws to a spot where he expects the receiver to stop and turn. Joining the New Orleans Saints my first year in the NFL, I survived rookie camp and regular camp only to get cut before the start of the season. I took the news like a deer lost in the glare of oncoming headlights. I had worked hard and come a long way from OTAs (Organized Team Activities), learning a lot, but of course nowhere near the playing ability of seasoned veterans. At the end of camp, the Saints acquired a nine-year player and I was bumped out of my spot on the roster. Moping at home in Arkansas with no job, I didn’t know what to do next. Had my NFL career, which started out with so much promise, ended so soon? I hung in there for weeks, working out and traveling across the country in tiny airplane seats when teams called me for a tryout. I grew weary of hearing, “If someone gets hurt, we’ll call.” No one called. I wanted off the NFL roller coaster. After prayer and a long conversation with my dad, I called my agent and told him I was done with the NFL and returning to finish college. In the dying embers of my passion for football, a spark ignited. Why not? With only two games left in the season, if it didn’t work out, I could return to college, finish my last few classes, and return to job searching. I flew to Houston and had a great end-of-season with the Texans. I was called into the office after the last game, where Rick Smith, the general manager, and Coach Gary Kubiak waited for me. “We want you for next year,” Rick said. Now, this is what the Lord says—he who created you, Jacob, he who formed you, Israel: “Do not fear, for I have redeemed you; I have summoned you by name; you are mine” (Isaiah 43:1). Those few words from God in Isaiah are loaded with hope, promise, and love. They are God’s words, not only for me, Jacob, or for the Israelites, but for all of humanity. The Bible is chock-full of comeback stories. Jesus, being crucified and coming back to life, of course, is the greatest story. Joseph’s experience in Genesis 30–50 is another amazing one. He was sold into slavery by his brothers and endured years of false imprisonment. At all times, Joseph maintained his integrity and faith. Even while in prison, God had a plan for His servant’s future. Joseph became one of the most powerful figures in Egypt, second only to Pharaoh. And in the end, when Joseph could have taken revenge on his brothers, he chose to forgive them, understanding that through the worst situations, God was preparing him for his destiny. If Moses, Joseph, and even someone like me can make a comeback, you can too. Ultimately, even if we’ve made mistakes, God wants us back. He doesn’t abandon His children. He wants us reaching our goals and living our life to the fullest. If things aren’t going well or according to our plan, we might have to run fast, turn around, and take a couple steps forward, like the comeback play. When we turn to face God, He will be there to redeem us and bring us to the place where He needs us. He loves us enough to open the right doors at the right time—and occasionally close them at the right time too. BIO: Jake Byrne has battled with type 1 diabetes since a young teen and has since been proactive combating the disease and mentoring diabetic youth. He played football for the University of Wisconsin as a tight end and went on to compete in the NFL. Originally with the New Orleans Saints in 2012, Jake has also been a Houston Texan, Kansas City Chief, and San Diego Charger. Addie Sullivan leads a quiet life in a northern California lighthouse. She mourns the death of her father and endures her mother’s bitterness, until the night a storm brings an injured stranger and a dark secret to her home. The man insists she is not who she thinks she is, but rather “Julia Eaton”—the child long lost and feared dead by her wealthy family. Seizing the chance to be reunited with the Eatons, Addie leaves her lighthouse home but decides to keep her true identity a secret until they can unravel the mystery. Addie loves the Eatons’ palatial home tucked away among the California redwood forests. She feels secure with the jovial family, adores the young boy who is her charge as governess, and finds romance with his father John, a young widower. But sinister shadows overtake Addie’s joy. As dusty rooms and secret compartments give up their clues about her past, Addie finds a faith and a love she could never have guessed. To embrace this new world of promise is to risk her life; but to run away is to risk losing the greatest love she’s ever known. Believe it or not this is the first book I have read by Colleen. I’ve heard wonderful things about her books but never got around to reading her work. Now I am wishing I didn’t wait so long. This is a book I purchased a long time ago and finally got the chance to read. This book has it all; romance, mystery, deception. I had no idea who was out to hurt Addie until it came to light. Even better there is a revelation at the end that totally caught me by surprise and that rarely happens. Addie is a wonderful character that might be a bit too perfect. Yet, she does face her own issues. She is definitely a people-pleaser and this is something I have dealt with personally. As she gets drawn more into her new family her eyes move away from Jesus and this is something she has to face. One of my favorite characters in this book had to be Gideon the dog. He reminded me a lot of my dog. He was so obedient and there to protect those he loved. This is a book a definitely recommend. If you haven’t read this book or anything by Colleen this is a great one to start with. I’d love to! 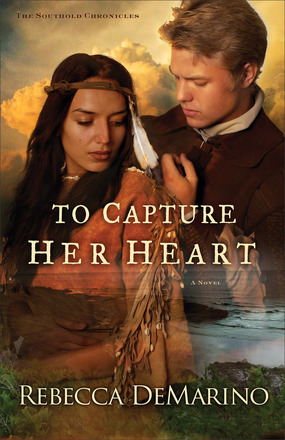 In 1653 Heather Flower, a princess of the Montauk tribe, celebrates her wedding feast when a rival tribe attacks, kills the groom and kidnaps her. Though her ransom is paid, she is nonetheless bound by her captors and left to die—until she finds herself rescued by handsome Dutch Lieutenant Dirk Van Buren. Still tender from her loss, Heather Flower begins to heal in the home of Englishman Ben Horton, a longtime friend of her people. But despite Ben’s affectionate attentions, she can’t stop thinking about the handsome Dutchman who saved her from certain death. Can she find peace again among her own people? Or will her growing affection for her rescuer draw her into conflict with everyone she loves? Does she choose loyalty or love? I love to travel, I like exploring genealogy and my roots, and gardening, hiking and baking are all pastimes I enjoy. The Southold Chronicle Series is based on the real lives of my ninth great-grandparents. They came over on a little ship called The Swallow in the 1630’s. My plan for the series was to take each book about the Hortons up a decade or two. While researching the first book, A Place in His Heart, I discovered a gold nugget of information about Heather Flower, the daughter of the Montuakett sachem, who was kidnapped on her wedding day by a fierce rival tribe. Tradition has it that the Englishman, Lion Gardiner, paid her ransom. The story was too good to ignore and it fit perfectly for the time period for book #2, so the story picks up after the ransom is paid. The Hortons and Southold are still the backdrop for the story, but Heather Flower is my lovely heroine. I am definitely a seat-of-the-pants writer! I’ve tried to jot things down, even loosely, but I find that I write best if I brainstorm my way through the story! Well, I can truly say no, and I realize that is not the norm. 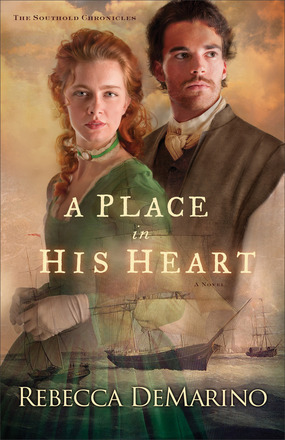 A Place in His Heart was not only my first published novel, but the first book I’d ever written. It is truly the book of my heart, and book #2, To Capture Her Heart, was just plain fun to research and write! I love that story!! There might be little pieces of me in all of my characters. Heather Flower’s happily-ever-after is snatched from her when she least expects it and she has many decisions to make, none of them easy. Like her – and most of us – I have had dreams dashed and losses to bear. But thank goodness we have a God who cares and will walk with us through it. I am working on the edits for the third book in the series, To Follow Her Heart. This story amazed me as I brainstormed through it! It’s Patience’s story and I love it! Thank you so very much, Melissa, for featuring me today! 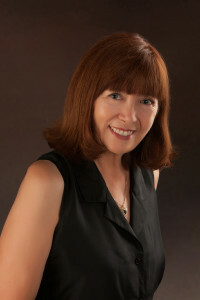 I love your heart for helping readers connect with books and their authors! You are a blessing to me! Readers, below is a link to a giveaway Rebecca’s publisher is holding. If you click on it you will be redirected to another page to enter that giveaway. If you want to check out my review of her book click here. You will also find links to Rebecca’s website and where you can purchase her book. This is the second book in the Southold Chronicles. It picks up a few years after the previous book with Ben Horton (who was just a boy when I finished that first book) is now a man looking for love. I loved seeing this next generation of Hortons and how they are making a life in the new world. More than anything I probably loved the history again and thinking about people who came over from Europe and what they went through to settle here. The book opens with Heather Flower being rescued and we are quickly thrown into the lives of all the characters. Heather Flower is a sweet (pun intended) young woman who is hurt badly emotionally and doesn’t know what to do next. Her heart wants to grieve her dead husband and the missing woman who were taken with her but her heart is also being pulled in other directions. Dirk seems to fall for Heather Flower pretty fast. I was a bit surprised when he thinks he loves her after only meeting her a couple of brief times. It seemed a little to fast for me but that’s my opinion only. You can read this book without reading the first but there are a lot of different characters and even I had trouble keeping them straight all of the time. I think if you read A Place In His Heart first you will better appreciate this one. Come back Wednesday when I interview Rebecca and she talks about this book. 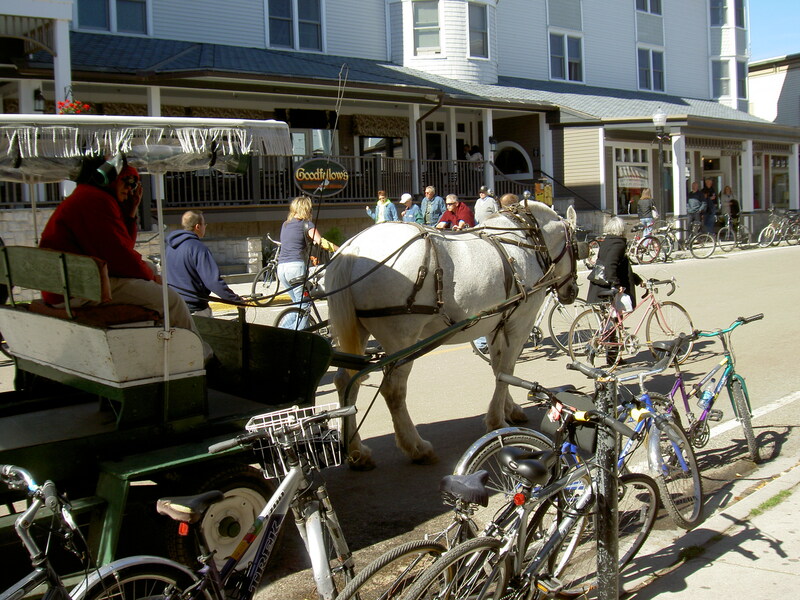 A couple of weeks ago we were visiting Mackinac Island again. The first thing we like to do when we get on the island is ride our bikes around the eight mile perimeter. When you first get on the island you are in the downtown area where all the shops are, this is where most of the people hang out. As you get further away from this main area there are fewer people. Because of this I let the kids get ahead of me but I always had an eye on them and they always knew I was right behind them. They enjoyed their ride, the wind whizzing by their ears, stopping to enjoy the shoreline or a brook. When we stopped we took time to be together and just take in the beauty. As we were heading back into town I told the kids to let me take the lead again because there would be a lot more people. If I was in the lead they could see me more clearly and hopefully not get in other people’s way or people wouldn’t get in their way. Almost as soon as those words left my mouth God dropped a thought in my head. When we take time to be in His presence we are truly free. We can just enjoy Him and not be distracted by the things, or people around us. This is like going around the island. I can not stress enough the importance of getting alone with Jesus. Only there can you find truth, freedom, peace. We need to learn to listen for his voice. He might tell us to wait up, slow down, stop and take a look at this beauty around us. But we won’t hear Him if we don’t know the sound of His voice. But we can’t do this all day (I wish). We will have to join the crowd again. When we join the crowd how much more we need to stay close to Him, but this is also the hardest time. How many days have I started out thinking okay, today I am going to really be aware of God’s presences as I teach, I am going to mediate on a certain scripture throughout my day. Then I reach the end of the day and realized it never happened. I got distracted by the business of life, the naughty child wouldn’t listen, the negative talk of another. My friends take this to heart. Make time to be in His presence, it will change everything. Will everything be perfect? Nope. There are many times I get done with a great time in His presence and then my kids are fighting or a comment is made in my house the makes me angry. But I remember. I have the truth to cling to and I follow Jesus. I won’t allow the negativity of others effect the truth that Jesus has spoken to my heart, but if you don’t know the truth you have nothing to hold on to. With tender hearts, Mary and Barnabas take a leap of faith and wed. But when Barnabas’s secret plans to move his family to the New World to escape persecution come to light, Mary’s world is upended. How could she possibly leave her papa and her dear sister? And will she ever reach the secret places of her husband’s broken heart? This was a such an interesting historical time period to read. Barnabas is under English persecution due to his puritan beliefs but marries Mary who doesn’t have those beliefs but that doesn’t’ stop them. There are many things to like about this book. Mary is a sweet character who only wants her husband’s heart. She is like so many of us, she marries thinking it won’t matter if he doesn’t love her like she wants but deep down that is all she wants. She wants his heart and wonders if she will ever get it. Barnabas questions how he could ever love a woman as much as he loved his first wife. Mary is good for his boys, he knows that and he does care for her but will it be enough? My favorite part of the book was the journey to the New World. I don’t know if I would’ve been able to stomach it. The ending is pure sweetness but I can’t tell you what happened. I also enjoyed how Jesus was very much in this book. The faith displayed by the characters is very strong and evident. It will give you more to think about as you look back on our (the United States) history. Grab you copy at your local bookstore, Amazon, Barnes and Noble, Christianbook.com, Books-A-Million or your favorite retailer.